You can evaluate your sleep and you can analyse how much time you have spent in the different sleeping phases like light sleep, deep sleep, and REM. Wear your personal coach directly on the wrist and start your personal training thanks to the on-screen guidance. Minimum requirements for the synchronisation: Mac OS X 10.6 and higher, iPhone 4S and higher, iPad 3rd generation and higher, Android 4.4 and higher and Windows 10 devices. Musi control via Bluetooth Classic on Android and Windows devices. Music control via Bluetooth LE on iOS devices. Fitbit Ionic - the high end fitness watch of the company Fitbit. 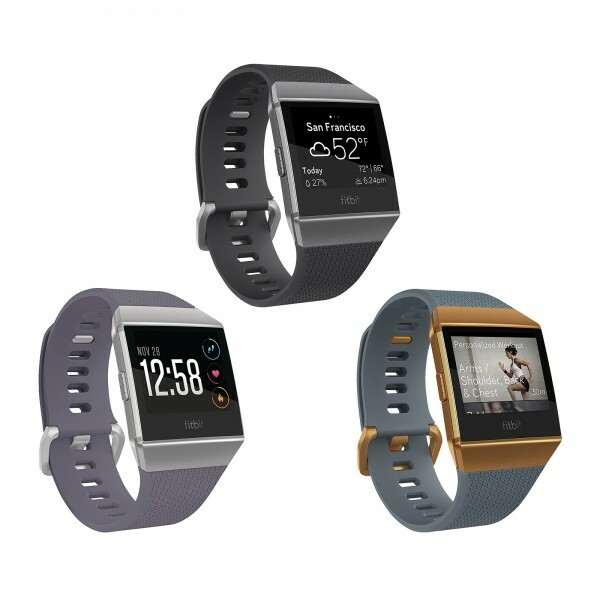 With the new Fitbit Ionic, Fitbit combines its health and fitness expertise with a multitude of additional features. The improved health sensor, the best GPS tracking of the branch as well as the dynamic on-device-guides workouts, the improved heart rate measuring or the resistance to water up to 50 m are just some features, which Fitbit has integrated in the new Ionic. Your personal fitness coach directly on-device. Using the Fitbit Ionic, you wear your personal coach directly on the wrist. Doing the dynamic on-device workouts, which adjust based on your personal requirements, you can perfectly train your fitness, strength, and endurance. These programmes have been developed by experts and athletes and help you to become better and quicker. Furthermore, the new Ionic tracks automatically your runs. Using the Run Detect function, you just need to step in front of your frontdoor and your training starts automatically. Speed and distance are displayed in real time with the new GPS. The application stops automatically, when you stop to drink something or to take a breath. Then it starts immediately at the end of the break. The smartwatch makes it possible that you have an extremely strong connection to GPS and GLONASS satellites at any place thanks to the branch-leading GPS and the unique design as well as the integrated antennas. Fitbit Ionic users can leave their smartphone at home and read the current distance, altimetres or interims at any time. Ionic works with an even more improved PurePulse® heart rate technology to measure even more precisely the burnt calories while doing intensive trainings like cycling, weight lifting or working out on the elliptical cross trainer. Due to displaying the real time heart rate, Ionic helps to optimise the training intensities and always have a good overview. Being waterproof up to 50 metres, the Ionic is perfect for any type of water sports. It is one of the first smartwatches, which displays lap timees, training duration or burnt calories in real time. Here, it doesn't matter whether you go swimming in the lake, in the open sea or swim some laps in the pool. Fitbit sets new standards with the introduction of the SpO2 sensors. These sensors allow to track important health indicators like sleep apnoea and auricular fibrillation. The Fitbit Ionic provides you a special motivation via the integrated music player, which offers space for about 300 songs. The Bluetooth headphones can be easily connected with the watch. Of course, the Ionic offers exactly what Fitbit is well-known for years. The integrated activity tracker records automatically your steps, calories, levels, sleeping phases, the state of your cardiovascular fitness, moments of rest, and many more. Fitbit Ionic- The strongest and lightest GPS watch. Fitbit, the world's market leader of activity trackers, attached great importance to the weight, the fit, the sturdiness, the breathability as well as a perfect wearing comfort when it developed the device. All these advances are represented in the new, stylish, and very modern Fitbit Ionic. Due to the unique design, Fitbit has managed to integrated two Bluetooth as well as a GPS antenna. The design allows a stronger GPS signal, which works in busy cities as well as on remote paths. Ionic was developed with new materials and more intensive test procedure than ever before in order to resist long and hard uses. It's especially the colour touch screen which allows brilliant graphics and a clear brightness up to 1000 nits - all statistics can be read at any time, no matter whether the sun is shining bright or you use it in poorly lit rooms. Offering a battery service life of up to four days or 10 hours, when the GPS mode is used. Adapt your Fitbit Ionic to your outfit. Using the replacement wristbands of Fitbit, you can ideally adapt your smartwatch to your outfit. No matter whether sporty, simple or elegant - the exchangeable wristband can be easily exchanged in a few steps, so that it fits to every event. Besides the health and fitness Apps of Fitbit, like Exercise, Fitbit Coach, Relax, Timer, and many more, the App Gallery also offers popular Apps, which make your life easier. Each App is especially designed for Ionic, so that no other accompanying, mobile Apps need to be downloaded nor any smartphone needs to be close by. Of course, Apps like Weather or Strava also work with the Fitbit Ionic. Strava, the leading socical network for millions of athletes, makes it possible to track easily the performance data of runs, cycling tours or swimming routes and to monitor these so that the user is continuously motivated and their progress can be monitored all the time. Fitbit Ionic, the new flagship of the company Fitbit. Classic sport functions meet the probably best technology on the market. Either beginner or experienced athlete, Fitbits product, which is the most advanced up to now, offers personal and easy-to-use instructions to motivate the user, while they stay connected to their most important Apps and messages - no matter which smartphone they use.